As a signer, there can be a multitude of reasons for rejecting documents. The tags could be wrongly assigned or in the wrong location. You could notice an issue with the document itself and some of its content. Signers have the option to reject documents and give reasons for rejection to help improve the next document. Click the More button in the top right and select the Reject option. In the window, enter a rejection reason to notify and let the sender know why you don’t approve of the document’s contents. This is important, as the reason will help improve the next document if the document needs to be amended. The reason will be shown in the notification email to the sender. Once the document has been rejected, you should have the document reloaded and no longer have access to tags and fields. After a document has been rejected, the sender can go to their Signority account and check the document history and status. 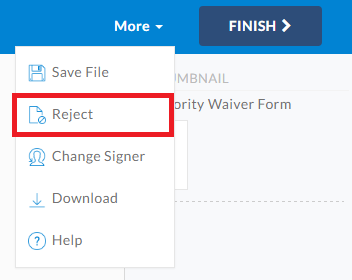 In the Recipient List page, you can see the E-Sign Status as Rejected next to the signer rejecting the document. 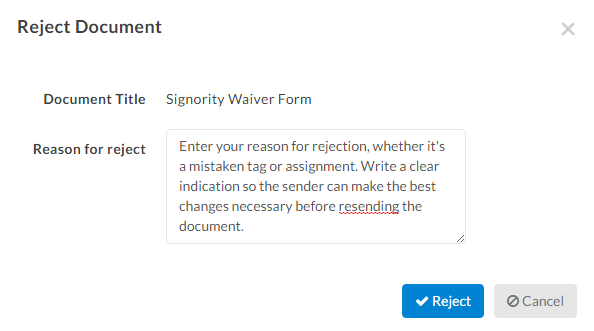 Alternatively, in the Document History page, there will be an entry with the reason for rejection listed under the Notes column and the Action column will have Document rejected by. As the sender, you will also get an email notification confirming the rejected document and information for the reason of rejection. The subject line will also indicate the document has been rejected, in order to quickly determine which document needs attention. 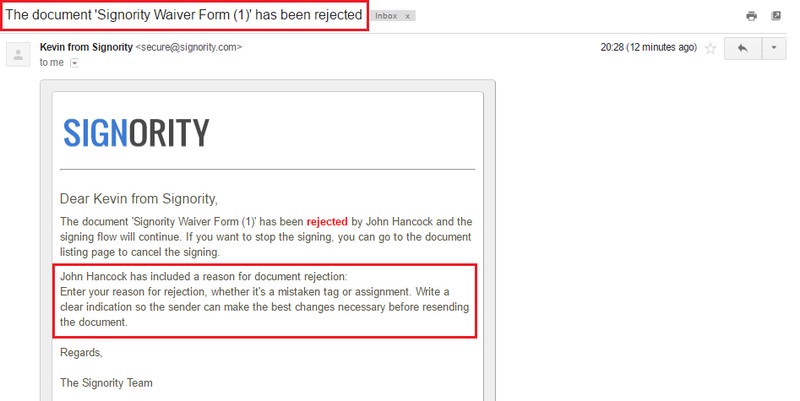 With the reason for rejection, you can resend the document with any changes or create a new document from scratch.